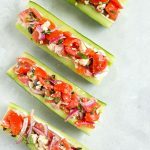 Crunchy, refreshing, nutritious and awesomely vegetarian and gluten-free, these Greek Salad Cucumber Boats make the perfect quick lunch or snack for summer days! 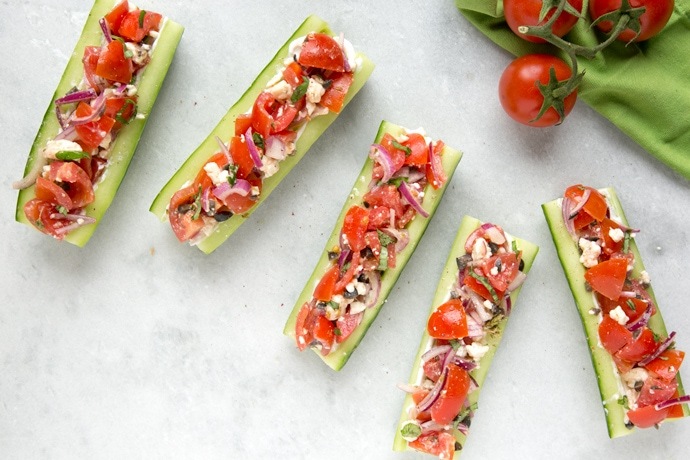 These Greek Salad Cucumber Boats have quickly become one of my favorite summer recipes. They’re incredibly tasty, refreshing, light and super crunchy, perfect for a quick lunch or snack that even the kids will enjoy. More over, they would totally rock at a summer BBQ , picnic or just over happy hour time together with a Strawberry Gin Fizz! 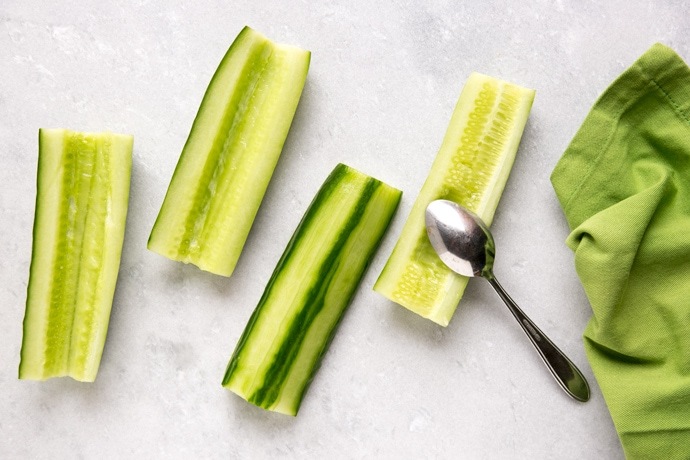 Summer is the perfect time to eat as much cucumber as you can. 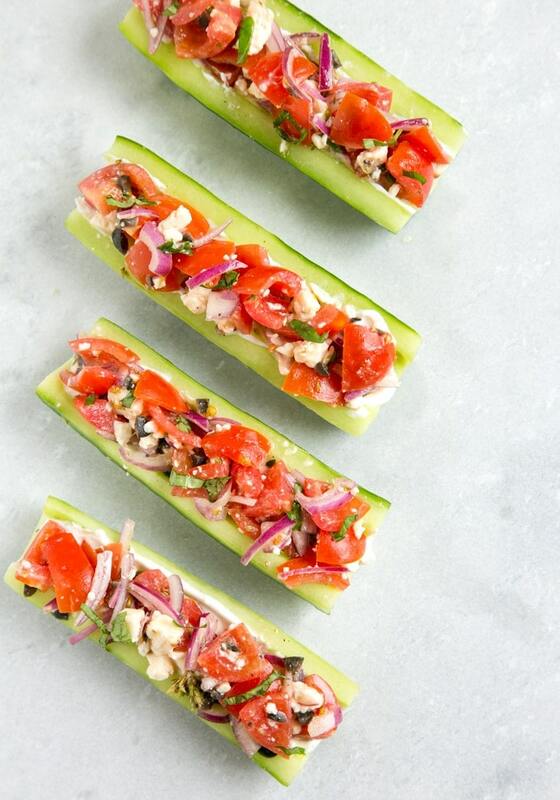 Chopped in salads, blended in smoothies, or just nature with a little salt sprinkled all over, there are endless ways to enjoy this light and versatile veggie – and cucumber boats are definitely one of the most fun! This super easy recipe features all the ingredients of a classic Greek salad, but served in a fun, creative way. Cucumber, tomatoes, feta cheese, kalamata olives, red onion, oregano and optional mint or basil leaves, are all tossed together and delivered in delicious, crunchy cucumber boat packaging. Best of all, these cucumber boats come together in just 10 minutes and there’s no cooking involved, so they’re perfect if you want to get the kids involved in the kitchen! 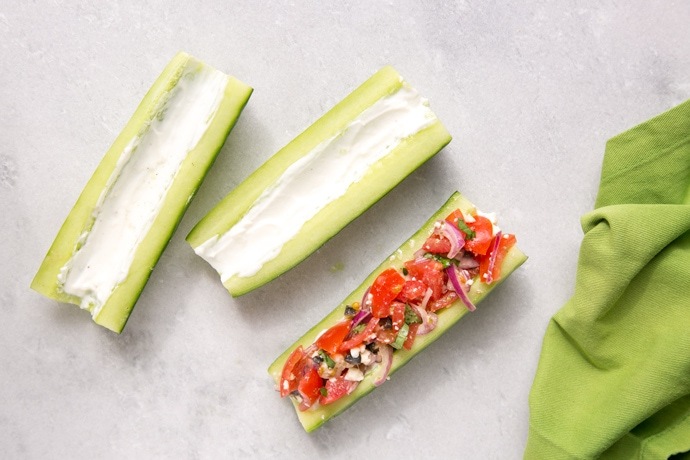 All you have to do is cut the cucumber lengthwise, remove the seeds and spread a little Greek yogurt or tzatziki sauce. 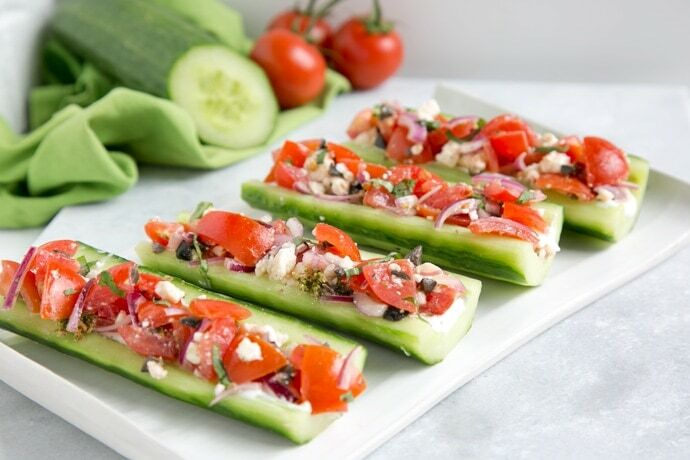 Top each cucumber boat with a spoonful of Greek salad, and they’re all ready to be devoured! 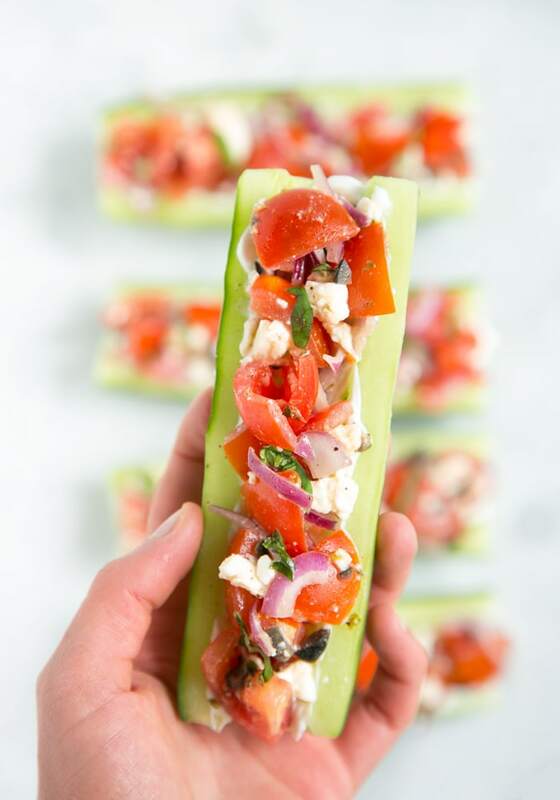 These Greek Salad Cucumber Boats are naturally gluten-free, and can be easily made vegan by skipping the feta cheese ( you could sub with some dairy-free cheese if you like). And if cucumbers are not your thing, why don’t give zucchini a try instead, since they’re still in season? Peel most of the skin from the cucumbers (optional). In a medium bowl, mix in chopped tomatoes, olives, onion, oregano, basil leaves and crumbled feta cheese. Season with a glug of olive oil and salt and pepper to taste. Spread a little Greek yogurt (or tzatziki sauce) over each cucumber boat, then spoon the Greek salad mixture into the boats and serve.